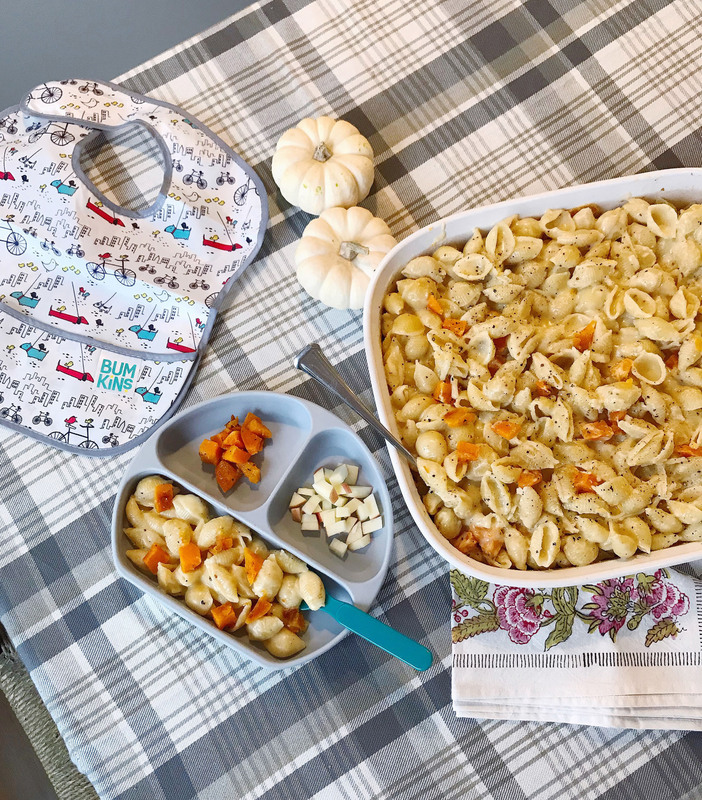 I am continuing on my mission to create to tasty recipes that are toddler-approved, while still being enjoyable for the adults at the table too. Jane, like most kids (and adults), is a big fan of macaroni and cheese. I recently made my classic homemade macaroni and cheese recipe, and stirred in some leftover butternut squash pieces and a few dashes of cinnamon while the pasta and cheese were still piping hot. 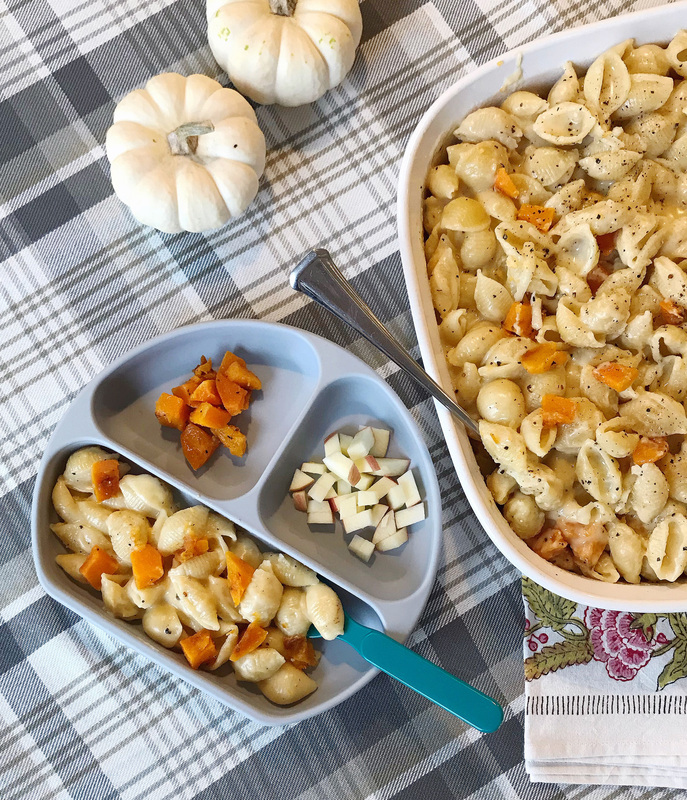 The butternut squash melted into the sauce and created a sweet, seasonal spin on my favorite pasta dish. It was such a hit that I made it again for a family party this weekend, and it was a hit with both the kids and the grown-ups at the party. Get the recipe details below, and head over to my Instagram page tonight for a fun giveaway with my friends at Bumkins! 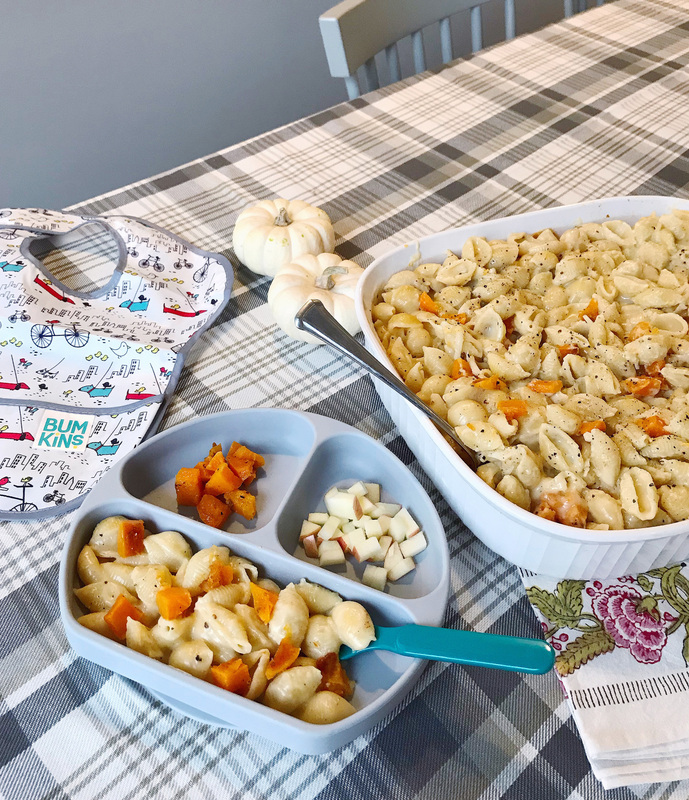 I’m partnering with them to giveaway one of their grip dishes used in this post, as well as some fun bibs and reusable snack bags that I use for Jane’s snacks. Pre-heat oven to 350 degrees; cook pasta as directed, drain and set aside. In a medium saucepan, melt butter and whisk in flour until combined and thickened. Whisk in Dijon mustard and whole milk, simmer until the mixture begins to thicken again. Stir in parmesan cheese and slowly add in shredded cheddar cheese, stirring continuously to combine as the cheese melts. Season the mixture with garlic powder, onion powder, cinnamon, and salt and pepper. Fold in cooked pasta and roasted butternut squash pieces. Transfer mac and cheese to a casserole dish and bake at 350 degrees for 20 minutes. The Download 10.27.17 Fall Entertaining Inspiration.